Seems like everything I pick up these days sparks a memory, and most of the time those memories take me back to my Newark roots. With a now yellowing slide rule in my hands, I can hear and see so very clearly the activities of that summer day back in 1966. It's Barringer High School senior awards day in the auditorium, just a few days before graduation. My inspirational science teacher, Morris Lerner, calls my name and presents me with a science award named in memory of a famous past Barringer educator and school principal, Roger B. Saylor. He mentions that since I am going to Newark College of Engineering (NCE), this slide rule should come in handy. Little did I know at that time that NCE had special significance for him as well, for as I later learned, it was from that same engineering school that he had graduated in 1937. Why would an engineer teach science at a high school, I mused,…..but let me not get ahead of the story. I’ll start by telling you about my greatest teacher, from whom I am still learning today. My Uncle Tony was a long-time janitor at Barringer, and for several years before I arrived there, he was talking about my interest in the sciences and engineering to Morris. When I arrived there, Morris talked with me and I was tracked into his Integrated Science (IS) program. This course of study was America’s answer to the Sputnik embarrassment; and designed to get more high school students into the technical professions. So in junior year, about 30 of us “techno-geeks” got initiated into what became the greatest learning experience of my life, surpassing anything I would later experience in college and graduate school. Our class was a tight knit group that took most of its other classes together as well. We could talk science and technology, and even thought we understood it, until Morris, the science department chairman, introduced us to Integrated Science. We soon learned that IS was science on steroids, and it packed a punch that cut across the entire curricula. Most high schools taught physics and chemistry in the last two years. IS was a unique approach that taught both subjects together for two years, moving back and forth between them, exploring their overlaps. It was also my first experience with a double period class. First and second period every day was IS. In the first hour, Mr. Lerner would saunter in with his lab cart and conduct an experiment, whereupon for the remainder of the hour, the class discussed its observations. No mathematics were used…..strictly verbal discussions. In the second hour, we explored the mathematics behind the observations. It went on like this every day for the entire junior and senior year. We were also required to set-up and conduct a detailed lab experiment every week, and submit a formal written lab report. It was the toughest and best course I ever took. The first experiment he conducted for our class was unforgettable. He simply took a candle, lit it and said, “You have one hour to write down as many observations of this candle as you can. A good observer will yield over 100 observations”. He walked out of the room and returned in an hour, whereupon we complained that the best we could do was about 60-70 observations. His reply was, “That’s probably because what you observed was only what you could see. What didn’t you observe?” By the end of the second hour we all had well over 100 observations recorded. As if this classroom rigor was not enough, we were required to complete 3 research papers per year, at least ten pages in length with formal footnotes and references. The topics selected for the papers were our own choice, but had to deal with science and technology. This is where the really big surprise came for our class. The papers were graded twice-once for scientific/technical accuracy and once for English/grammar. “Good ideas mean nothing if you cannot communicate them!” Morris shot back. He was tougher on us than our English teachers. We all soon started carrying a dictionary and a thesaurus. It became very apparent he was not coming down to our level. We were going to climb up to his. Our term papers were also required to address the social and economic impacts of the subject we were discussing. This was another unique aspect of this incredible course. Here I learned how technological changes influence history, art, music, society, government, and law; and vice-versa. All this in a science class. Current scientific/technological advances as reported in the newspapers or magazines, were often debated in class. We were called upon to marshal quantitative facts and figures in support of our oral arguments. Could Morris be right? Is this really what science and engineering was all about? Suddenly all my other courses paled in stature, almost boring when compared to the intellectual challenge of his class. For the first time in my education, all the subjects were being knitted together into a tapestry, every single day, not just for a special project or term report. What he taught us was to ask tough questions and realize that the answers to problems lie with the questions you ask at the outset. There were no right answers, only questions, fashioned through our understanding, readings, and intellect. I realized I was the creative element in solving problems; and life did not have the answers in the back of the book as school had previously conditioned us to expect. His course was liberating and scary at the same time. His tests were equally memorable. Every problem he gave us to solve was a word problem. None of that “given this-find that” stuff. You had to be able to read and understand the problem, and then lay out the process for solution. You could use all the books and notes and anything else you wanted during the tests. This revelation shook me. How fortunate I had been. Today, science teachers are in very short supply……. as many as 60% of the K-12 science and math teachers teach under temporary certifications. These are not popular subject areas for teachers to major in while in college. Depression era science teachers were super-qualified to teach by today's standards. Students like myself benefited from that superb and highly dedicated cadre of Depression-era individuals who chose to teach in the Newark high schools. These teachers also brought a great deal of experimental, and hands-on experience to the classroom, with their classes taking on a practical/applied approach to the subject matter--- so distinctly different from the often lab-less, theoretical approach to science in the schools today. As I prepare to leave Morris for the cold evening air and a nostalgic ride home, he takes me for a quick tour of his basement workshop, showing off some electronic gadgetry he has assembled and uses regularly. In his late 80s, his questioning mind still reaches out for knowledge and practical applications---the very same fire he started in my classmates and me still burns vigorously within him. Leaving his home, I hug him and thank him for everything he taught me. He smiles and hands me a book…..”Give this a read. We’ll talk about it next time”. Happily clutching my homework, I drive home with a warm glow. In his years before retirement from the Newark School System in the late 1970s, Morris gave Newark a gift, a wonderful vision to both the city and its youth. He envisioned and proposed what is now the highly acclaimed Newark Science High School, where annual state mandated testing ranks this school among New Jersey’s top institutions. All this magic happens on a side street, in an old converted factory building, in downtown Newark. Soon the school will have its own new building. The school embraces many of the things he taught at Barringer---proving how when challenged with rigorous problem solving and relevancy, students can achieve-----inner city kids can aspire to and achieve professional careers. It epitomizes the man and his teaching style, showcasing technology education as a vibrant method of teaching. I carefully put the old slide rule back in its cracked leather case. It’s well-worn edges testimony to the exercise I gave it at NCE and later at work, until electronic calculators made all slide rules obsolete. It’s a symbol of my profession and the hours of study and work I put in. It started with Morris and that incredible course, and today, the man is still mentoring me. 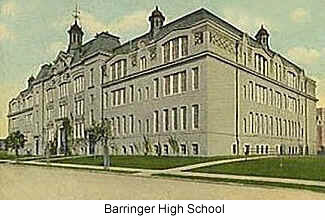 Every time I think of Barringer, or see it as I drive home from work through Branch Brook Park, I think of Morris Lerner. Great teachers have a way of staying with you. How very lucky and blessed I have been to have met and befriended this man—my greatest teacher.